One of my favorite childhood memories was going through my mother’s recipe box and choosing what Christmas cookies we were going to bake that year. I grew up in a big family with three sisters, and we all had our favorites. •Always start with your ingredients at room temperature. •Always use unsalted butter in your baking; you can decide how much salt to add to the recipe. •Take the butter out of the fridge a few hours before or even the night before so it will be soft. •To bring eggs to temp quickly, put them in a bowl with hot tap water. After a few minutes they will be ready for baking. • Use parchment paper every time you bake; it prevents cookies from sticking to the pan, makes for easy cleanup, and I never bake cookies without it. Cookies are a great way to get into baking even for beginners. Kids love to lend a hand; and with a little bit of effort, you can make amazing little bite-sized goodies that no one can resist! Below is a favorite shortbread cookie recipe with some easy variations. The basis of this recipe is hundreds of years old. It’s the basic 1-2-3-4 shortbread recipe: one part sugar, two parts fat (I only use unsalted butter), three parts flour and 4 eggs for every pound of sugar. Plus 1/2 teaspoon of salt and a teaspoon of vanilla, of course. Assuming everyone doesn’t own a kitchen scale, I went ahead and altered the recipe slightly for home bakers using measuring cups. What I love about this recipe is its flexibility; you can get many different cookies with just one recipe, therefore saving precious time that we are all in such short supply of! Cream butter and sugar together. Add egg, vanilla, and salt and mix well, scraping down the bowl until it is all mixed together. Add flour, and mix until combined again, scraping the bowl as necessary. Jam thumbprints: Scoop the dough into balls, and place onto a cookie sheet lined with parchment paper. Space the cookies 2 inches apart. Press your thumb (or use a wine bottle cork) to make the indent in each cookie, and fill each with your favorite jam. Bake at 350 degrees for 12-15 minutes, cool before removing from the cookie tray. Hershey’s kiss cookies: Scoop and press the indents just like the jam thumbprint cookies. Bake the cookies at 350 degrees for 12-15 minutes with the indent, and immediately when they come out of the oven, press an unwrapped Hershey’s kiss into each one. The heat of the cookie will melt the chocolate slightly and once the cookie cools, the kiss will stay in place. Sugar cookie roll outs: Wrap a portion of dough and place it in the fridge for 20 minutes. It is easier to roll the dough when it is slightly chilled. On a lightly floured surface, roll the dough into a thickness of about 1/4 inch. 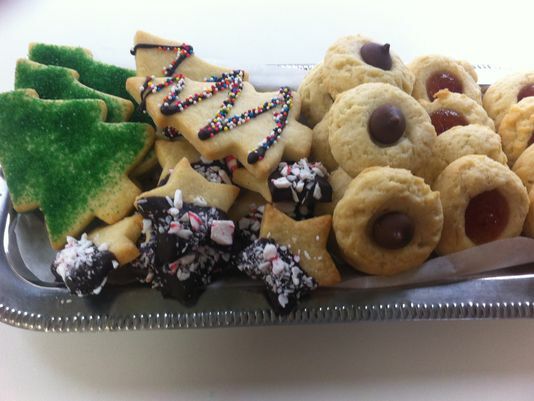 Use a star cookie cutter and place the cut- outs onto the cookie sheet and bake at 350 degrees for 12-15 minutes. When they are completely cool, melt semi-sweet chocolate chips in the microwave and dip half of each cookie into the chocolate. Sprinkle crushed peppermint candy onto the chocolate. So cute and yummy! You can fill a plate of cookies with a variety of shapes and sizes with just one recipe and in one evening. This holiday season I wish you peace, happiness and I hope you’ll bake! Susan O’Keefe knows a little bit about sweets. She proudly says if people are gaining weight from eating at her bakery that means she’s doing her job. Susan has been baking for her entire life; she had a childhood dream of owning her own bakery. Some of the treats made at Baked by Susan are the same recipes from her childhood. Baked by Susan operates a retail and wholesale bakery in the quaint little village of Croton-on-Hudson, where everything is baked on the premises from scratch every single day. Stop by and treat yourself to something sweet!